International punk rock band ALIEN ANT FARM has been confirmed as the headliner of Center Stage Management's inaugural Back 2 School festival in association with GEMS Education. Held at Dubai Festival City, United Arab Emirates on Friday, October 17, the festival will included performances by local bands NERVECELL, OBAG and SUNKING, while a number of activities are conducted and competition winners are announced on the main stage. Incorporating the theme "Shout! Share! Live! Unite! ", the ComposeIT, DesignIT, SingIT, RockIT, WriteIT competitions were held as a way of unearthing some of UAE's youngest and most dynamic musicians, dancers, writers and designers from different age categories. All finalists will be listed on the Back 2 School web site with audition dates and winners will be announced on the day of the festival, on the main stage. 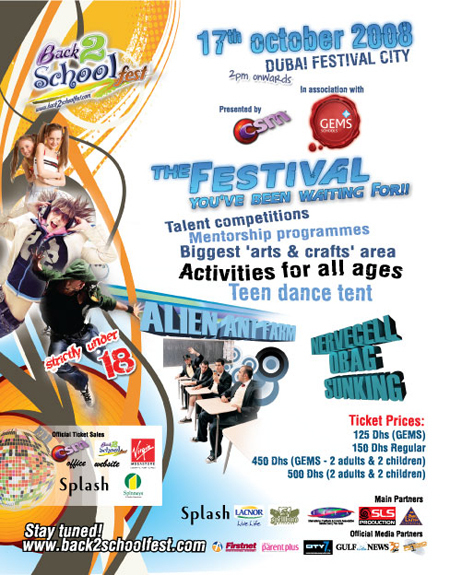 For more information, visit www.back2schoolfest.com.